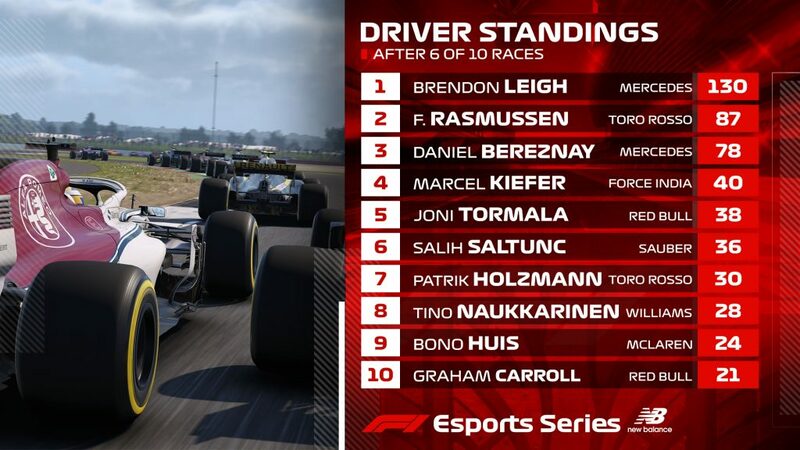 After another tense, exciting and dramatic live event in the F1 New Balance Esports Pro Series 2018, once again it was Mercedes AMG-Petronas Esports and their talismanic driver Brendon Leigh who emerged on top at the Gfinity Esports Arena in London on Wednesday night, consolidating their leads at the top of the team and driver standings respectively. There was drama and controversy in the opening race of the day from Circuit Paul Ricard. After starring at Live Event One three weeks ago, where he took two wins and a runner-up spot from three races, Leigh crossed the line in front once again, following a titanic race-long tussle with Frederik Rasmussen – only to be initially demoted to P6 by the race stewards for causing an unavoidable collision. However, after a tense couple of hours and repeated examination of the race footage, the five-second penalty given to Leigh was overturned, meaning the Briton kept his victory – a fourth win from the first five races of the Pro Series. 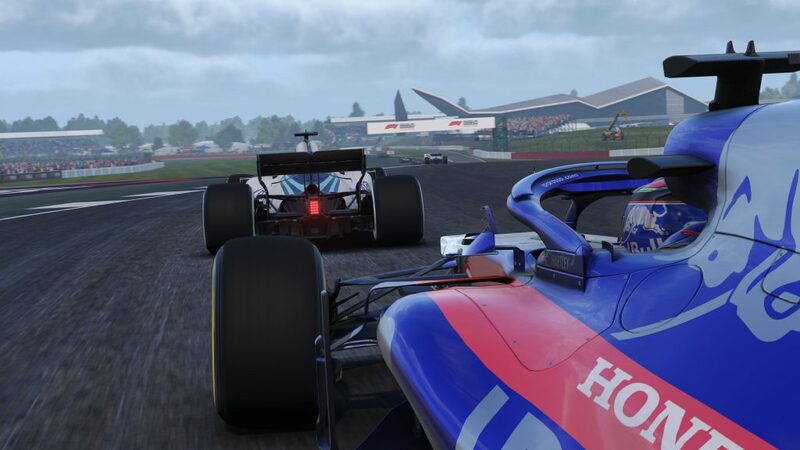 Rounding out the podium in France were the Toro Rosso duo of Patrik Holzmann (P2) and Rasmussen (P3). Amazingly, Leigh wrapped up yet another victory, in less controversial circumstances, in Race Five at Silverstone. Fans were treated to another tense duel between him and Rasmussen, with the Briton prevailing by less than a second from his rival. It might have all been so different though – early on, Fabrizio Donoso Delgado powered past Leigh in his Force India to opened-mouthed applause in the arena, briefly taking P1 – before incurring a penalty for speeding in the pit lane that would ultimately cost him a realistic chance of victory. 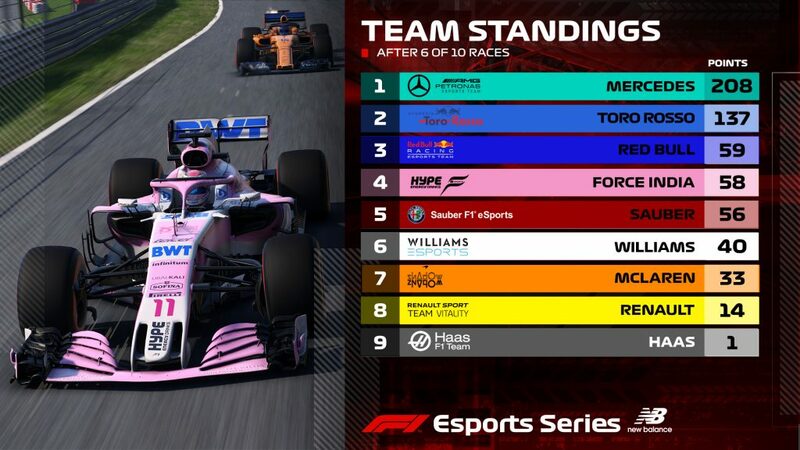 More drama was to follow at Spa in the evening’s final race, when third, fourth and fifth positions were separated by just 0.025 seconds, with P4 (Salih Saltunc) and P5 (Brendon Leigh) crossing the line and being given exactly the same time. Further up the road, Leigh’s Mercedes teammate Daniel Bereznay coasted to a comfortable victory, chased home by Red Bull’s Joni Tormala.